Join us for our annual Men's Wild Game Supper as we hear from former missionary, Robert Fortenberry. Admission is free. 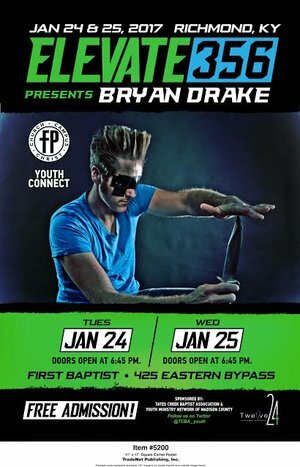 Christian illusionist and Gospel presenter Bryan Drake will be the featured guest at “Elevate 356” at First Baptist Church of Richmond on the evenings of January 24th and 25th. Bryan is an effective communicator who engages students in matters of truth and deception. This free event is being sponsored by the Tates Creek Baptist Association in cooperation with some of our other mission partners.